Nepal is one of the best countries for sightseeing, with its long history, fascinating art and distinctive and varied architecture. The vast diversity of people, their culture, language and traditions will intrigue anyone. The two predominant religions, Hinduism and Buddhism, are ever present with the variety of gods and goddess, numerous temples, stupas and monasteries, and depict the deep faith of the people. The panoramic mountain scenery and a diversity of beautiful landscape will enchant you and make your visit one of the most romantic and memorable ones you have ever experienced. Nepal is the land where Buddha was born - Buddha, the symbol of peace. The legends recount that the Katmandu valley was once a great lake and that Buddhist people believed Manjushiri broached the valley wall with a magical sword, draining the water and creating the Katmandu valley. The Hindus claim it was Krishna(God of Hindus) who performed the might deed, hurling a thunderbolt to create the Chobar George. The scientists agree that the Katmandu valley was submerged at one time and the rivers of the valley do indeed flow southwards through the narrow Chobar George. Choose whichever legends you prefer. In Katmandu valley three cities are famous for sightseeing which called Katmandu, Patan and Bhaktapur. The Katmandu valley provides you ancient Hindus and Buddhist pilgrims historical places where numerous temples is, monasteries and stupas are dominated. All the temples, monasteries and stupas are decorated by enormous arts and architecture. The Katmandu valley also offers you very old Royal places which built in 12th century ,long historical explanation old museums about political, social and religious happened in the past moment, people culture and them life style and grand and fascinating mountain views. In Katmandu valley three cities are famous for sightseeing which called Katmandu, Patan and The Katmandu valley provides you ancient Hindus and Buddhist pilgrims historical places where numerous temples is, monasteries and stupas are dominated. All the temples, monasteries and stupas are decorated by enormous arts and architecture. The Katmandu valley also offers you very old Royal places which built in 12th century ,long historical explanation old museums about political, social and religious happened in the past moment, people culture and them life style and grand and fascinating mountain views. Katmandu Durbar square Pashupatinath is protected by UNESCO world heritage site. Katmandu Durbar square (old Royal palace) which built in 12th century. The Durbar square provides you numerous temples, Kumari Bahal (House of Living Goddess), Kasthamandap (house of wood) and the old museum. Pashupatinath : Pashupatinath is protected by UNESCO world heritage site. 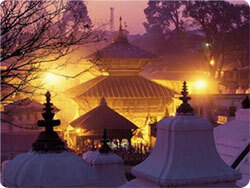 Pashupatinath is the holiest Hindu pilgrimage destination in Nepal. There are linga images of Shiva a long with the statues, shrine and temples dedicated to other deities in the complex. A temple dedicated to Shiva existed at this site in 879AD.However the present temple buil by King Bhupatindra malla in 1697AD.A gold plated roof, silver doors and woodcarvings of the finest quality decorate the Pagoda construction. There are rows of Shiva shrines and Hindu pilgrims from all over south Asia offering(Puja)worship to Shiva tile of lord of destruction. The Bagmati rivers follows close by and the Arya Ghat cremation grounds are there. Bouddhanath : Bouddhanath is protected by UNISCO world heritage site. Bouddhanath is among the largest Stupas in the south Asia and it has become focal point of Tibetan Buddhism in Nepal. The white looms 36 meters overhead. The stupa is located at the ancient trade route to Tibet and Tibetan merchants rested and offered prayers have for many centuries. When refuges entered Nepal from Tibet in the 1950 century many of them decided to live around Bouddhanath. They established many Gompas and little Tibet Nepal was born. This little Tibet still the best places in the valley to observe Tibetan life style. Many people believe that Bouddhanath was constructed in the fifth century. The Bouddhanath is the visual feast of the colorful Thangkas, Tibetan jewellery hand-woven carpets; mask and Khukuri (knives) are sold in surroundings stalls. Patan city: Patan is protected by UNISCO world heritage site. 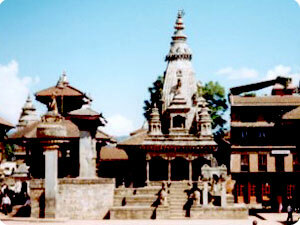 Patan is the second largest city in the valley. It is some time referred to as Lalitpur, which means city of beauty. Patan has long Buddhist history and the four corners of the city are marked by stupas. Patan's central Durbar square is absolutely packed with temples. It an architectural feast with a far greater concentration of temples per sq meter than in Katmandu or Bhaktipur. Numerous other temples widely diverse style as well as many Buddhist monasteries are scattered around this fascinating town. The Patan Durbar square is a concentrated mass of temples, undoubtedly the most visually stunning display of Newari architecture to be seen in Nepal. There is also many others numerous temples are Krishna, Bhimsen, Taleju bell, Bhai Dega and others many temples gives you more experience about Nepali people faith and respect on religion. All the temples are decorated by numerous arts and architecture. The Patan also offers you Newari people culture and them life style. Bhaktapur city: The Bhaktipur city is protected as a UNESCO world Heritage site. Bhaktapur, also known as Bhadgaon, it means city of the Devotees. It is the third major town of the valley and in many ways the most mediaeval. The Bhaktipur is on of the most charming architecture showpieces of the valley as it highlights the ancient The main items of interest in the Bhaktapur are: The lion gate: Dating as far back as AD1696, this gate is guarded on either side by two huge statues of lions. A long side, there are two stone images of Gods. TheGolden gate: The golden gate is said to be the most beautiful and richly molded specimen of its kind in the entire world. The Golden is the mostly lovely piece of art in the whole Kingdom. Changunarayan : The Changunarayan temple is protected as a UNESCO world Heritage site This is the most ancient temple of Katmandu valley. The temple built third century is decorated by some of the best samples of stones, wood and metal crafts in the valley. A fifth century stone inscription, the oldest to be discovered in Nepal, is located in the temple compound and it tells of the victorious King Mandev. Some Popular Sightseeing Places out of Katmandu valley. Nagarkot : Nagarkot situated an elevation of 2175 m, 32 km east of Katmandu. Nagarkot is a widely enjoyed hill resort. It has been a weekend spot for mountain viewers in quiet and comfort. The sunrise viewed from this hill present you the ever-refreshing memory of the majestic panoramic view of the Himalayan ranges from Dhaulagiri in the west and Mt. Everest in the east.